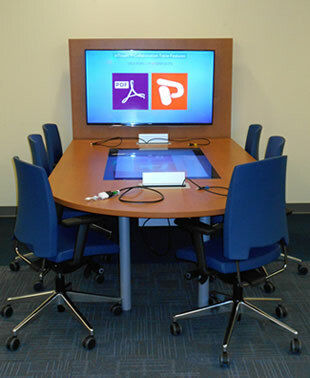 Henderson Library’s Learning Commons’ Interactive Touchscreen Table is intended for collaboration, group work and/or the rehearsal of presentations. If you have questions about the use of this table, please contact the Learning Commons Information Desk at 912-478-5645 or by email at learningcommons@georgiasouthern.edu. Current Georgia Southern Faculty, Staff and Students can reserve the Interactive Touchscreen Table. An active Georgia Southern email address is required to reserve the table and to log into networked resources. The Interactive Touchscreen Table must be reserved on a first-come, first-served basis. Reservations must be made through the online form; walk-in users will be directed to the online form. A MINIMUM of 2 users are required to reserve the Touchscreen Table. If a single user is occupying the table, s/he will be asked to relinquish the table to a group of 2 or more users. Reservations are limited to a maximum of 2 hours per day (a “day” is defined as the hours between 12:00 am and 11:59 pm, but reservations must begin 1 hour after the library opens and must end 1 hour before the library closes). Reservations may be made up to two weeks in advance but you MUST acknowledge the confirmation email within 30 minutes to book your table reservation. Users are asked to cancel reservations at least 1 hour in advance. Users are asked to check out the Touchscreen Table remote control and adapters from the Checkout Desk. The Learning Commons Librarian or a designated person will provide instructions on how to use the equipment if necessary. Instructions will be available at the Learning Commons Information Desk. Food and drink (in closed containers) are permitted. However, the requestor assumes all responsibility for any damages (facility or equipment) that may occur while using the table. Please be on time for your reservation. If you do not occupy the Touchscreen Table within 15 minutes after your reservation period begins, the room will become available for another person to request. The Touchscreen Table cannot be reserved by leaving personal belongings at the table. The library is not, and will not be, responsible for items left at or near the table. Unattended items will be taken to the Lost & Found at the Checkout Desk on the second floor of the Library.